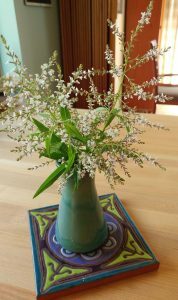 My lemon verbena is blooming like mad right now, so I clipped some yesterday to bring inside to accen tuate the kitchen. As usual, I stripped spare leaves from lower part of the stems before popping them into the vase. So I stared at that pile of gorgeously aromatic herb leaves…hard to just toss in the compost when it offers so many possibilities. A syrup to use in cocktail? (One of my favorite recipes I developed for Cooking Light is this Lemon Verbena Gimlet.) Maybe a batch of sorbet or ice cream? Then I spied the 5 or so ripe plums sitting on the counter nearby. 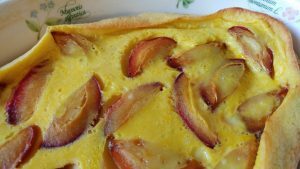 I’d used a bunch of those farmers market plums for a clafoutis last weekend. Hmmmm. Lemon verbena and plums? So I recreated that clafoutis with an extra step of steeping the milk with a generous handful of lemon verbena: I bruised the leaves, rubbing them between my palms briefly, added to the milk in a small saucepan and brought slowly to a low boil over medium heat. then set aside for about 30 minutes before straining. Otherwise I followed this recipe, a regular in my summertime roster that always takes me back a few decades to a friend’s kitchen in France. This particular version I baked yesterday looks rather saffron-yellow, not because of anything I added to the recipe, but simply because I used outstanding eggs from Green Bow Farms at the farmers market, with their brilliantly-colored yolks. The lemon verbena flavor is subtle, as it should be. I’m not sure how well this would work with other herbs…oooh, aside from perhaps fresh bay leaves. I’ll definitely be trying that option one day before long.